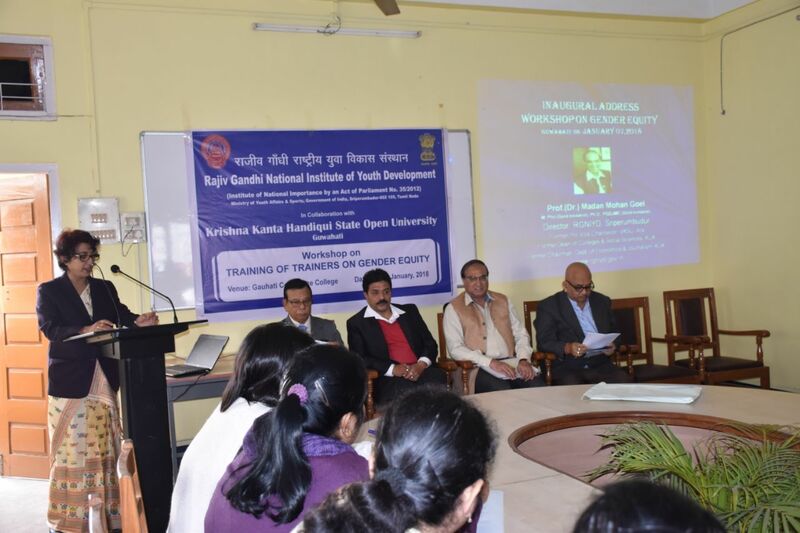 Guwahati, January 07 – A three days ‘Workshop on Gender Equity’ for Training of Trainers (ToT) jointly organised by Rajiv Gandhi National Institute of Youth Development (RGNIYD) Sriperumbudur and Krishna Kanta Handiqui Sate Open University (KKHSOU) began here today at the Gauhati Commerce College. While delivering the inaugural address Professor (Dr.) M.M. Goel, Director RGNIYD said that gender equity is inbuilt in spirituality wherein soul is gender neutral. He justified gender equality on the basis of red blood running in the veins of every human being. To ensure women empowerment, Professor Goel explained ‘SHE’ model with three attributes of spirituality, humanistic behaviour and existence which calls for ‘ASK’ model consisting of abilities of head and heart, skills and knowledge. The skills of morality, credibility and accountability are the components of the ‘MCA’ model which is more than the degree of MCA necessary and sufficient for excellence in information technology. For the sustainable human development with gender equity, we need to become street SMART (simple, moral, action oriented, responsive and transparent) in the strict sense of the concept along with SIMPLE model of youth empowerment consisting of six human development activities such as spiritual quotient (SQ) development, intuition development, mental level development, love oneself attitude development and emotional quotient (EQ) development. The synergy of these six aspects is essential requirement of the desirable human capital for the Indian economy to emerge and realize its full potential, explained the Director RGNIYD. Earlier Shri Rajan Baran Mohanata, Registrar KKHSOU welcomed the guests .Ms Avinu Veronica Assistant Professor and Coordinator of the programme gave the brief details of the workshop and Dr Homeshwar Kalita Principal proposed the vote of thanks.